Welcome to GEM College of International Business Amber Campus. Our mission is “to assist individuals and corporations towards achieving their highest potential”. With Australia being the only country that registered an economic growth for 25 consecutive years, we strongly believe our knowledge and learning methods are a good point of reference for all entrepreneurs. All of our courses are recognized and officially accredited by the Australian Government (https://www.asqa.gov.au). We strongly believe that our postgraduate programme, which have been built on educational programs established and constantly improved since 1993 can be a tool for businessmen and women to acquire a different viewpoint and serve as an alternative to a MBA degree. The Amber Campus is the European Headquarters of GEM College of International Business established in 1992. Hence, we are able to offer over 25 years of tradition in business education, with all qualifications, including our core postgraduate study programs are accredited by the Australian Government (https://www.asqa.gov.au). GEM College prides itself on offering “pracademic courses” – they are practical and they are academic. We merge the best of academic rigour, and practical commercial application. We believe our post graduate programs be an excellent alternative to various MBA programmes offered across Europe. The directors commend GEM College of International Business Amber Campus to you and look forward to meeting you personally. Gdańsk is a Polish city on the Baltic coast. It is the capital of the Pomeranian Voivodeship, Poland’s principal seaport and the centre of the country’s fourth-largest metropolitan area. The city lies on the southern edge of Gdańsk Bay(of the Baltic Sea), in a conurbation with the city of Gdynia,Sopot, and suburban communities, which together form a metropolitan area called the Tricity (Trójmiasto), with a population approaching 1.4 million. Gdańsk itself has a population of over half a million, making it the largest city in the Pomerania region of Northern Poland. The industrial sections of the city are dominated by shipbuilding, petrochemical & chemical industries, and food processing. The share of high-tech sectors such as electronics, telecommunications, IT engineering, cosmetics and pharmaceuticals is on the rise. 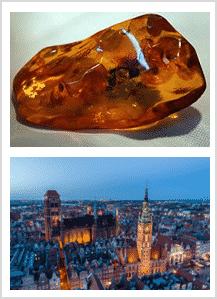 Amber processing is also an important part of the local economy, as the majority of the world’s amber deposits lie along the Baltic coast. The Pomeranian Voivodeship, including Gdańsk, is also a major tourist destination in the summer, as millions of Poles and other European tourists flock to the beaches of the Baltic coastline. GEM College Australia is a Campus of GEM College of International Business, working together with Workright Australia (http://workright.com.au) and the Australian Government. We are registered by the Australian Skills and Quality Authority (https://www.asqa.gov.au/) as a Registered Training Organisation (RTO) National Code 0366. We have an unblemished record of quality delivery and compliance, as is evidenced by a history of positive outcomes. The European Amber campus focuses on delivering the highest quality Postgraduate programme for managers and entrepreneurs.